Too busy, too busy–I missed posting yesterday and all I can do today is marketing. Yes, but I must. 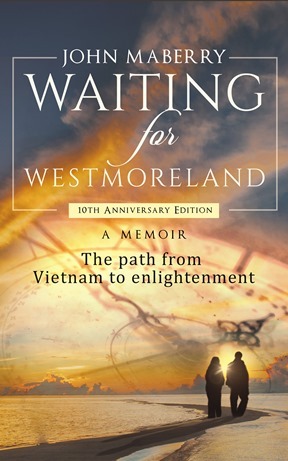 Waiting for Westmoreland, is now available (online only, so far; although you can get in-store pickup at Borders) at Barnes and Noble, as well as Borders. That is in addition to Amazon.com and Lulu.com. So if you haven’t got the book yet, what are you waiting for? If you read that, then everything you see here will make more sense. I know that there hasn’t been much here yet, but there will be–I promise. Happiness–Relative, Absolute, and does it Fluctuate? Shankar Vedantam had a Science page article in the Washington Post today, Is Great Happiness Too Much of a Good Thing? He begins with an anecdote about an 80 year old man who, after suffering a head-first tumble over the handlebars of a bicycle at age 70, has not only survived the ordeal but finds reasons to feel grateful about life. The man reportedly feels neither regret nor sorry for himself despite losing the use of his legs due to a spinal injury. Vedantam goes on to highligh the results of a new study by University of Virginia psychologist Shigehiro Oishi, which superficially seems somewhat out of phase with the anecdote. According to Vedantam, Oishi says that people who experience many more positive than negative events seem to get less joy from additional happy events — and ever larger bad effects with each negative event. “Getting to ‘very happy’ is like climbing an ever steeper mountain. Additional effort — positive events — doesn’t gain you much by way of altitude. Slipping backward, on the other hand, is very easy.” Vedantam reports. I find interesting confirmation and correlation to Buddhist principles in relation to this piece. Undoubtedly most people would prefer to be happy. But what is happiness? Is it the absence of hardship? In the article, Vedantam mentions satisfaction, short-term contentment, global happiness and day-to-day happiness among other things, but misses, I think, taking the critical step of defining terms. Rapture, one of the states of being (or worlds) in which human beings may move through each day from moment to moment, is something we experience when things go exceedingly well and we are overjoyed–from the mundane effects of the touchdown scored by our favorite team, the taste of a great piece of cake at a happy celebration, or even the peak of an amourous encounter. All of these fall under the rubric of relative happiness. As the referee disallows the touchdown for an out of bounds catch, the cake is all gone, or–well you can imagine about the amourous encounter, the happiness is gone. Absolute happiness, in contrast, is that confidence and conviction–that sense of contentment like that of the 80 year old, that no problems in life cannot be surmounted. I have no doubt that I will experience frustrations, difficulties, and various negative phenomena on a regular–if not a daily basis. This is especially true when I am exerting myself strenuosly to accomplish some objective I find important. I no longer find this reality disturbing. Yes, it is annoying; but it does not diminish my happiness. On the contrary, it elevates it. Having been married twice unsuccessfully, I hazarded a third marriage despite a death threat from my prospective father-in-law. The outcome has been 27 years of happiness increasing on a day-to-day, month-to-month and year-to-year basis. That is the power of challenging one’s destiny, challenging the fundamental darkness that would keep me from the path of the Buddha. Nam-myoho-renge-kyo. If “ignorance is bliss” and “romance is bliss” then romance must be ignorance, right? No, I don’t think so. It’s a faulty syllogism. Right now, a lot of people are concerned about illegal immigration. They think a rising crime rate is a problem of illegal immigration. They think immigrants are taking jobs legal Americans could otherwise have. They think they are overcrowding neighborhoods, draining government resources for education and healthcare. Are these observations valid? Consider who settled Georgia, among other of the original 13 colonies which had a large contingent of convicts from their native land–England. They worked out OK in the end. If illegal immigrants have fake social security cards, with bogus numbers, who gets the benefit of any FICA taxes collected from paychecks? Those dollars go into the U.S. Treasury for the benefit of the Social Security fund. What jobs do these people take? The ones no one else wants. But shouldn’t we care that they are illegal? Yes, but the whole issue is an overblown distraction, a red herring, an easy target at which to point. So what? It avoids thinking and acting on real problems facing America. A failure to resolve this overblown problem then becomes yet another source of frustration with the government and politicians–avoiding personal responsibility for one’s own success or failure, one’s own happiness. They all give credit, blame or control to someone or something outside ourselves. The devil doesn’t make anybody do anything; people choose to do things. God doesn’t whisper in employer’s ears, advising on who should get promotions. Why would a change of scenery make life any happier? Happiness lies in the confidence not only that you control your own destiny, but that you can achieve whatever you want or overcome whatever adversity faces you. If you are unhappy where you are, going somewhere else just changes the view–not the reality. This is a small glimpse of the value of a Buddhist perspective on life. More to come. Well, that should be enough for a start. More tomorrow. Welcome to Views from Eagle Peak! This is where I will pass along my observations on a variety of topics. I am off to a slow start at this, having spent countless hours getting up the Waiting for Westmoreland website and the Eagle Peak Press website. But the publishing world has convinced me that an author must have a “platform”–most often created these days via a blog. In connection with Eagle Peak, the general notion is to create value by revealing the laws of cause and effect at work in day-to-day life–whether at home, in the workplace or the world at large. I’ll give you some examples in the next couple days.